Hi everyone I'm Jack Red, I haven't talked much about Sega consoles I owned in the past. I never had a Sega Master System or Sega Saturn. I always been a huge fan of their work since my child hood. Of course two particular Sega consoles I don't even need to introduce. Sega Genesis & Sega Dreamcast are two of my personal favorite game consoles of all time. Today I want to focus more on Sega Dreamcast for many reasons. I have talked about things involving or related topics to the console. I didn't get the chance to set the record straight why I love it so much. Sega made sure to left a major impression on everyone with their final game console. You could even say most of today's gaming services & hardware is heavily inspired by it. I had a few great reasons for not including it in my take of the sixth gaming generation console wars. Yes Sega Dreamcast did compete against Sony PlayStation 2 but it was around one year. It was competing against Sony PlayStation 1 & Nintendo 64 holding it's own for the most part. In a way it was sad Sega suddenly pulled out of the console wars mostly due to some major mistakes. Sega Dreamcast never got to go head to head against Nintendo Game Cube. Which by itself was an amazing underrated game console. At least it tried against Nintendo 64 despite having a shorter run than that discontinuing in the same year. For many people not only this is their favorite Sega game console, it also their overall favorite. Everyone agrees Dreamcast was truly ahead of it's time. Microsoft copied the basic controller designs & smart hardware choices. Not many game consoles around the time can play online. PlayStation 2 requires knowing exactly what to do with not many games supporting the feature. Dreamcast was the first game console all you have to do is plug in your internet wire to play online. Dreamcast was also the first game console to correctly emulate the arcade experience. Don't get me wrong there's plenty of great arcade ports on several consoles. Most of them on Dreamcast are hands down the finest among them. Dreamcast also started the dlc business structure that became majority in later years. Just think going back to Sonic 3 on Sega Genesis. People seem to forget Sega has done so amazing times over the years. Sega Dreamcast's VMU actually it's own handheld console. Sadly Sega didn't do a good job advertising it in their commercials. In some games it adds more to the experience. Not many game consoles took advantage of a similar feature. Nintendo 64 had a device to allow your pokemons from supported games to be in both Pokemon Stadium games. Yes Dreamcast was technically the least powerful among it's gaming generation. At the same time it is truly amazing how insanely well their games holds up today. Dreamcast does have a great library of games. Just like some older game consoles, Dreamcast does have newer homebrew games being made. In fact it is in the top 5 among all game consoles with that I'm not kidding. Dreamcast is way more than what most of us believe it to be. I really can't criticize a major design flaw this console has. Dreamcast in my opinion could've out done Game Cube with the right strategy. What's really strange is all of PlayStation 2's competitors made so little in comparison. Yes I know they're in the millions which is still a lot of money but PlayStation 2's total sells trumps all three of them. End of the day who cares about how much it made, being the least powerful among them or pulling out too soon. What should matter in my personal opinion is loss in today's gaming. Dreamcast had the right balance in their games. Going from graphics to audio to controls, it still being talked about today. I strongly felt most newer game consoles focuses too much on dlcs, graphics and online play. Honestly those things could be nice but I rather get everything already included in a game instead. I mean come on, some games trick people into virtually buying more than the actual game. Which is where I draw the line. I am fine with season pass until missing dlcs starts to become common. 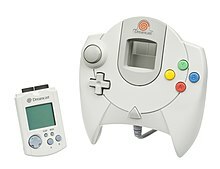 Dreamcast had one of the finest game controllers I ever played. A lot of people are mixed about how Sega went about the wire. Dreamcast later got a game compilation although it really should've had more games. Seriously Sega we only get four games out of a few hundred games. To me, Dreamcast brings a lot of fight with it. Don't let it fool you into thinking it's not worth your time because it really is. Sega went in weaken from bad decision with Sega Saturn. This game console gets the biggest anniversary hypes I ever heard for any game consoles. For what amazing reasons too, Dreamcast also had some amazing accessories. Believe it or not, it was sorta a thing to attempt recreate the PC controls on your game consoles. In Dreamcast's case, you get a keyboard very similar to a computer's keyboard for a few supported games. Sega Dreamcast did make a similar amount to Sega Saturn around nine million. Still not bad for a Sega console am I right? Some console wars really make me question how many gamers view many things. This console fits perfectly better than most game consoles. Sure you can set it up like some game consoles but at least the set up is simple. I kid you not the cult following for this console is absolutely mind blowing. I could talk a great deal more about it. Just in case some users never heard how I ended up getting a Sega Dreamcast. I was visiting one of my cousins, I watched Sonic Adventure played on his living room TV. Keep in mind I was a kid at the time, I honestly couldn't believe how damn good the game looks & sounds. Not too long afterwards, I got it to keep the console for a couple years. Sorry folks I loss count how long but I made sure to enjoyed it when I did. Sega Dreamcast was not only a farewell from Sega to leave the console wars. It also acts as a new beginning in getting more games out on more platforms. Which that direction is still going strong today. Dreamcast evolved gaming faster than any game console before it. The sound overall on Dreamcast is still one of my favorites among all the game consoles I owned. You got a great variety of games for many gamers including party games. Even the bad games doesn't hold Dreamcast down for long. This console not only stands the test of time but the expectations of gamers alike. I felt if Sega never released Dreamcast, we would be several gaming generation behind in gaming technology alone. I am honestly not kidding because most of what you expect from gaming originated from this. I would even go as far to say this is one of the very few game consoles that's perfection. I won't say that about many game consoles in general. Game Boy Advance, DS, Game Cube and Xbox 360 are the only perfect consoles to me. In many ways Dreamcast made up & surpassed Saturn while rivaling Genesis. To me Sega Genesis for many reasons is my favorite Sega console. Dreamcast sure gave it a run for it's money. This console was revolutionary in every sense of the word. Most of it's console exclusive games are truly amazing. In most game comparisons with Dreamcast, it usually wins most of them. Dreamcast is virtually a small phone many years before one & an arcade in your house. If anyone seriously doesn't like Sega Dreamcast is no gamer to me.